The team's results are published in The Astrophysical Journal Letters; the first study appears in today's issue, while the second study appears in the March 20th issue. "It was a little stressful at times," said van Dokkum. "On one hand, this is how the scientific process is supposed to work; you see something interesting, other people disagree, you obtain new data, and in the end you learn more about the universe. On the other hand, although the majority of the critiques were constructive and polite, not all of them were. Every time a new critique came out we had to scramble and figure out if we had missed something." Van Dokkum says he's proud of his team for pulling together in those tough moments. Their hard work has paid off, with the universe cooperating and giving more reason to look for other UDGs like DF2 and DF4. "We hope to next find out how common these galaxies are and whether they exist in other areas of the universe," said Danieli. "We want to find more evidence that will help us understand how the properties of these galaxies work with our current theories. Our hope is that this will take us one step further in understanding one of the biggest mysteries in our universe – the nature of dark matter." The likeliest explanation is that dark matter is a myth, and the unusual rotation of galaxies is due to an extremely strong gravitational pull of the black holes at their centres. Relativity theory breaks down at the event horizon, so we have no knowledge of the laws of physics there. New laws will apply. Since DF2 and DF4 are 'ultra diffuse galaxies', with 100-1,000 times fewer stars as similar sized galaxies, they may not have acquired the central black hole. Yet another blow to the alternatives like MOND and other modifications to relativity. To find that there are galaxies that have no dark matter really militates strongly against some field effect. Galaxies *with* dark matter behave like this; galaxies *without* dark matter behave like that. It's pretty compelling; it says galaxies without dark matter are different from galaxies with it. The likeliest explanation is that dark matter is a myth, and the unusual rotation of galaxies is due to an extremely strong gravitational pull of the black holes at their centres. It's not and no it isn't. Mass of a black hole can be determined very accurately and it doesn't account for the total mass needed for the fast rotation most galaxies have. I'm also pretty sure the scientist will have probed for a central black hole and accounted for that mass before making such a claim. I'm replying to one now, am I not? Yes, you did. You replied to an oyster. Dark matter is a supersolid that fills 'empty' space, strongly interacts with ordinary matter and is displaced by ordinary matter. What is referred to geometrically as curved spacetime physically exists in nature as the state of displacement of the supersolid dark matter. The reason for the mistaken notion the galaxy is missing dark matter is that the galaxy is so diffuse that it doesn't displace the supersolid dark matter outward and away from it to the degree that the dark matter is able to push back and cause the stars far away from the galactic center to speed up. Well Kem, if DM is a myth, then you need to account for the Inverse Square of gravitational attraction & how it applies in our own Galaxy. I see results as this. Confirrning my speculations that this Universe is beset with stochastic processes. Just because YOUR galaxy lacks the figleaf of DM? Does not dictate what MY galaxy being cozy in DM. Begrudgingly, we will have to admit that, throughout Reality, "unique" is "commonplace". No nice neat, orderly categories will explain what we observe. Those Cosmic dice are still rolling. Place your bets & take your chances. There is the possibility, that developing a Quantum Gravity Theory, might help us understand what is going on within the perimeter of an Event Horizon. Maybe explain why Gravity is so different from all other Forces. Why only gravitational attraction comes out of a BH. Why doesn't gravity ever wear out or lose the power to pull? But, the gravity can't be determined. Even if you could accurately estimate the mass of a black hole, you could not begin to guess at the gravitational pull. Relativity theory would give it infinite gravity, therefore relativity theory breaks down beyond the event horizon. Gravity is also a function of density, which is irrelevant for 'normal' matter. Bob is on the hunt! Dark matter appears devoid in these diffuse galaxies, containing far less matter than typical. This further indicates that dark matter is simply linked to matter, likely simply an optical effect induced by concentrated matter. As far as the demise of MOND, inquiries should consider models where the effects of gravity are limited in distance. Perhaps to 10KLYrs or so. Physically, this makes more logical sense, rather than relying on a math fairy's conclusion. Uhh, Ken, you are contradicting yourself. If the G-pull of a BH cannot be measurable? How can you explicitly deny it? Especially on top of your claim that galactic structures are entirely determined by the Pull of the Central BH? Without the assistance of DM? The mass of Sag*A is estimated at prox 4 million stars based on the observed effect of it;s 4M+ Gees upon the surrounding accretion disk. There is no other viable explanation for the velocity attained by tetratonnages of debris, crap & clouds of flatulence circling the EH. Just reposting this here before any of our usual crackpots infesting this poor forum try to imply this disproves dark matter. You cannot apply Newtonian physics to black holes. You cannot even apply Einsteinian physics. Einstein himself admitted this. Dark matter has never been detected. Its existence is merely inferred from the rotation of galaxies. Do you really think that an exotic, purely theoretical form of matter, about which nothing is known, and allows light to pass through it undimmed, is a good theory? Then explain the lensing that supports DM. The lensing is caused by the much stronger than realised gravity from the black hole, of course. Total nonsense. Where is this written up? Do you really think that tiny bits of energy that zip around crazy speeds t that can also exist in multiple states of being at the same time, over here and over there, not two but one, and behave as a particle, but also as a waves blah blah blah is a good theory? Not to mention you basically just described what neutrinos are, other than the fact that they have been detected and confirmed. If the universe was confined to what made sense to a bunch of apes, it would be a very boring and horrific universe. Ken, I will give you the benefit of the doubt, as I have not noticed your previous comments. I will assume (yeah, I know) that you are confused & not deliberately woomongering. Inside the perimeter of an EH. Outside the perimeter of an EH. Inside EH, all Matter & Energy is disassembled into their Planck Foundational Gravitrons. That's why "Black" or more accurately Stygian Oubliette. All that comes out is gravitational attraction. A greedy glutton determined to swallow the Universe. No Rules, No Laws need apply for admission. Outside the EH perimeter Newtonian Laws dictate that the Gravity from the BH is dominant across the Accretion disk. Ravenously pulling it in side the EH to be destroyed. However that is a mess of junk constantly bouncing off each other. Ejecting some of it screaming off into Space. A cosmological version of pick-up-stix while the table is is shaking & the windows wide opeb to a jowling gale. Ken, please wiki Inverse Square Rule. Yeah, If I can remember that far back? I don't think I believed it either. Cause it didn't seem to apply to me here on the Earth's surface. How would you explain the limits of tides upon the waters on the Earth's surface? & How the Moon keeps trundling around the Earth? & how the Earth & Moon stay paired up orbiting our Sun? Why didn't they mention the bullet galaxy. The collision is leaving decelerating matter in the center and two galaxy sized dark matter masses are separating like two gravitational shadows. This volume of non interacting something can be detected by gravitational lensing. The gas and stars in the center will be depleted of dark matter leaving a filament connecting the two areas of dm. In maps of dark matter you see filaments. For the THIRD time on this thread, you cannot apply Newton's laws to black holes. And, since relativity theory breaks down at the event horizon (otherwise the gravity would be infinite), it ought to be obvious that unknown laws of nature are at work in black holes. Which has nothing to do with their mass and therefore their gravity. And, since relativity theory breaks down at the event horizon (otherwise the gravity would be infinite), it ought to be obvious that unknown laws of nature are at work in black holes. Wrong, relativity breaks down at the singularity in the interior of the black hole. It can describe the horizon well. Gravity of a black hole is the same as a gravity of an object it collapsed from, minus gas that got blown off. Your repeated implications that black holes have something weird going on with their outside gravity field are just pseudoscientific nonsense. Do you really think that an exotic, purely theoretical form of matter, about which nothing is known, and allows light to pass through it undimmed, is a good theory? It surely is. Dark matter is merely yet another particle, similar to neutrinos and even predicted by supersymmetry. It is a very plausible theory indeed. Certainly less radical than MOND or who knows what else. Yet another blow to the alternatives like MOND and other modifications to relativity. To find that there are galaxies that have no dark matter really militates strongly against some field effect. . . . It's pretty compelling; it says galaxies without dark matter are different from galaxies with it. Da Schneib, IMHO you got it exactly right. I see no basis for the comments above challenging DM based on this article. Unless somebody can show these galaxies have a LOT LESS normal matter than they appear to, MOND is looking dead. That is because MOND says gravity is STRONGER at great distances than expected by the inverse square law, thus DM is not needed to account for the extra gravity. That alone should make you question MOND, and finding galaxies devoid of DM that function under Newtonian physics is very powerful evidence MOND is wrong. Dark matter is ... displaced by ordinary matter. I realize this gets pasted into the comments of every article with 'Dark Matter' in the headline on Phys.org; and the rest of the points declaring things about GR are suspect, but this bit I've quoted sounds like something I've wondered about. Can a particle be turned inside out, like a popcorn seed to a popcorn kernel? So that it no longer can be measured at specific points in time and space but instead occupies all locations across its waveform equally. Would a particle that cannot have a definite coordinate position appear as non-interacting in all ways aside from it's mass and exclusion of itself or another particle within its possible spread of coordinates? The reason I use popcorn as an example is because it's both an easy to picture example of Granular Convection https://en.wikipe...nvection and an easy to picture example of a change from a definite state to a more diffuse state. This would offer an explanation of why Dark Matter is never detected locally: everything from hydrogen in interplanetary space to the matter in the detector is too densely packed to allow a more diffuse particle to get near enough to make a detection; and every true vacuum we try to create is contained within the ordinary matter of our local area of space. Is there a central black hole in this galaxy? Or to put it more general, is there a (statistical) relation between the number of black holes and the presence of Dark Matter in a galaxy? I was kind of looking for some neat graph showing rotational velocity of stars related to their distance from the center of galaxy but couldnt find it in the paper. They write of some "robust evidence" but I fail to see it. Maybe somebody could write some more insider review of the paper and better explanation of how they reached to their conclusions. sorry Ken but you are deliberately conflating the BH's inside EHs, with Newtonian Physics which occurs outside the EH. As if a claybrick was similar to a block of water ice. You are just wasting both your time & mine. Go talk to the woomongers. They'll tell you what ever the hell it is you are imagining. If they talk you into lending them any money or your car? You'll never see either ever again. How woukd that even work? Other forces do not gain strength at a distance. The speed of a photon is the same from your lamp as a photon from a star billions of years away. Wouldn't a stronger gravity, outside galaxies be pulling them apart & visibly shredding all the little satellite galaxies, star clusters & intergalactic filaments of trash & gases apart? & the first error I think is can gravity be accelerated? It's all about the "Pull" & not about the push. What sort of mechanism could accelerate non-material gravity? Have you tried firing off an e-mail to the author(s)? Mark. I do not see any evidence for Gravitational Attraction gaining any strength at a distance. That above-linked mainstream article (and my posts therein) points out the ON GOING ejection of ordinary matter to deep space. Hence we should EXPECT to find such UDGs within gal-clusters, because that deconstructed/recycled matter is RE-forming into NEW HUMONGOUS clouds of matter which then produces 'young-looking' stars, globular-star-clusters and young-looking 'faint' UDGs. Moreover, if that matter being constantly sent to deep space is not yet fully converted to bright STARS, then such 'young-looking' UDGs must STILL have a LOT of FAINT/DARK BUT ORDINARY matter/mass in the cloud of ORDINARY 'recycled matter' from which these UDGs are STILL forming. This isn't about individual stars, Ultron. It is reporting the velocities of the central galaxy and several globular clusters. within it. @ Really-Skippy. How you are Cher? (That's the rhetoric thing again, I can see you are up to same falsifying ways.) I am good, thanks for asking. ,,,,,,, and you thought you would help them out by adding that part in on you own? Thank you Mark for correcting me. That assumption I jumped too was two axe-handles across! I know, I'll blame that Ken guy for disrupting my usual cheerless disposition & quarrelsome nature. When I am NICE to people?! Well, now... got that off my chest. time yo go see what else I can screw up! Hmm, I'm not even going to bother with that RC drivel. @Iwin, I can't quite visualize your idea well enough to say "yes" or "no." I will say that in the LCDM theory, dark matter is cold- that is, it's not moving at relativistic velocities. So you might want to think about that. Nonsense. Do you think scientists who are far better qualified and more intelligent than you, just sit around making stuff up for the hell of it? The case for DM is very robust. The few alternatives are dropping like flies. We don't know what DM is, but we are pretty well certain that it has to be there. And why is it ultra-diffuse? Because it is missing the central core star. 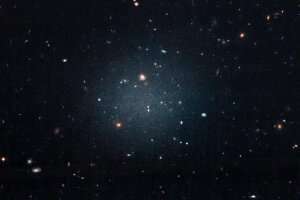 Instead, it contains a number of intermediate cores within the rather luminous globular clusters, that themselves are responsible for seeding the galaxy with star-forming material. However, these less massive cores themselves eject far less total new matter in a more widespread fashion, leading to the ultra-diffusion condition. So you are conflating neutrinos that have been proven to exist - with Dark Matter that has NOT been proven to exist and is, as yet, a possible but improbable substance that is of an indeterminate and unquantifiable hoped-for Mass that remains undetectable through modern optical instruments. not a scientist... my understanding of gravity was that everything has a pull on everything else, except you get drawn to the object proportion to size and distance no? There only a part of the universe thats observable. Surely we still have a gravitational pull to the parts greater than 14 billion light years away? Could dark energy just could be the gravitational pull to these? Yes, of course they are making stuff up, way ahead of their technological ability to CONFIRM what they have made up. Similar to the made up nonsense of the inclusion of "time" with Space as Spacetime, at the behest of Einstein's teacher, Minkowski. This is how scientists get the public stirred up - to get them ready to accept the theories, whether proven or not. Too many failed theories and the public begins to doubt what they have been told is true. that remains undetectable through modern optical instruments. @tadhg, that might explain dark energy, but it can't explain dark matter. Dark energy pulls things apart; dark matter pulls them together. But you forgot (or didn't know) one important thing: gravity acts at the speed of light. So anything that's beyond the cosmic horizon (the farthest things we can see) cannot act on us. You got gravity just about right, but you forgot your mass. To be precise, the measured force of gravity is directly proportional to your mass times the thing you're being attracted to's mass, and inversely proportional to the square of the distance. The constant of proportionality is called G, the gravitational constant. Go away you untutored poser. Gravitational lensing shows invisible mass. Explain it. The simulations of the filamentary nature of the universe only match observation when DM is included. Rotation curves prove there is unseen mass. You are a scientifically illiterate, anti-science troll. When the neutrino deficit was shown to exist, did we throw away our models of the Sun being nuclear powered? Or did we consider that our theories about neutrinos being massless might be wrong? Get a life. Get an education. Well thanks for agreeing with me. But neutrinos have the disadvantage of their small size, and yet they are determined to exist beyond their qualifications/abilities. However, the public is less reliable as a naysayer in the case of the neutrino due to the small size of the particle. Well, that sentence might make sense where your alien overlord comes from, but it makes no sense in this universe. Yes, of course they are making stuff up, way ahead of their technological ability to CONFIRM what they have made up. Similar to the made up nonsense of the inclusion of "time" with Space as Spacetime, at the behest of Einstein's teacher, Minkowski. This is how scientists get the public stirred up - to get them ready to accept the theories, whether proven or not. 'Shows INVISIBLE mass', hey? Do you even comprehend what you have just said? OK, but I still fail to find a graph showing speed of globular clusters correlated with distance from the center of this galaxy. Alien overlord? What alien overlord, jonesy. There is only one Universe that was created. Perhaps you are recalling DS saying/claiming that I'm an "alien lizard", hey? I still have no idea what that was supposed to mean, jonesy. And noway am I antiscience. Idiot. Failure to comprehend = moron. Lensing is caused by mass. The amount of lensing, and its distribution, seen from e.g. the Bullet Cluster requires unseen mass, you useless oaf. Go read about it. rrwillsj, in all candor and honesty, we are on the same page surprisingly often. @Ultron, the globular clusters paper was an earlier paper. You'll find it in the citations at the end of this paper. Before they could only see the globulars; this new instrument has enabled them to see the collective spectrum shifts of the stars in the UDGs as they sweep across them. I'll also point out that this is a letter, not a full paper; you shouldn't expect what you're looking for in such a communication. You might (and you do in this case) have to look at other papers for confirming evidence. Exactly. Lensing IS caused by Mass, where photons/light is redirected to another path. So where and what is this UNSEEN Mass? Perhaps it is flatulence emanating from huge unicorns within the Bullet Cluster? If it is UNSEEN, then HOW do you or anyone know that it is Dark Matter? Do you even comprehend the term "invisible"? Yes you are anti-science. Being scientifically illiterate and posting on a science news site shows that plainly. As well as claiming to be an alien lizard. And just plain thick. A black cat in a dark alley is invisible. If it scratches you, that's evidence it exists. You STILL haven't explained how Dark Matter can exist if it is not visible with optical/telescopic instruments. Science is belief in the UNSEEN. Untutored fool. What would be a good placeholder name for mass that we know to be there, but is not seen in visible light? Take your time, dumbo. Neutrinos aren't seen, thicko. Go away. Get an education beyond primary school. If I get a cat scratch in a dark alley, my obvious conclusion is that it was a black cat, not a devvul or a space alien. Again, are we done here? I linked to mainstream article supporting everything I said, mate; so, effectively you are calling mainstream info "drivel". Is NOT READING the 'science method' you employ so as to remain ignorant; and so make your many uninformed rants against me, mate? Not good. You may feel better; but you are remaining wilfully ignorant by not reading crucial info so that you may avoid ranting like an ignorant troll. Not good. @113LiarRC lies on another thread. You lied again @113LiarRC. You misquoted another reference. Well thanks for agreeing with me. the particle. I have never said that Neutrinos are seen, you idiot. Stop lying. YOU go away and take your buttbuddies Da Scheide and CaptainStrumpet with you. Of course poor DS cries "liar!" at the drop of a hat; without even realising I linked to a mainstream article that supports everything I said in my relevant post. How can such an unheeding troll ever learn from his many faux pas? Pity. How does that help the people with no background Cher? I mean peoples with a lot of science background can't even understand your new/simple/alternate/meaning/contexts when you are posting. You some times remind me of Trump-Skippy who is fond of the ALTERNATIVE FACTS. It is in Da Scheide's DNA and his upbringing. Same as with SpookyOtto, Captain Strumpet and Castrovagina. What else could it be? They settled theirselves firmly into physorg - not to discuss the Science topics in order to come to a valid conclusion without animosity and mayhem - but to give the impressions to one and all that these 4 losers are the best of the lot and already KNOW all there is to know - as nonparaleil as could be. They lie because they like to tell lies. What "deconstructed/recycled matter?" And how much, according to what observation documented in what paper in what reputable reviewed scientific journal? This is @113LiarRC's standard MO: declare something true for which the only evidence is statements made by it previously that didn't have any supporting evidence in the first place. and thinks it should be taught to children. How does that help the people with no background Cher? I mean peoples with a lot of science background can't even understand your new/simple/alternate/meaning/contexts when you are posting. Then link it again. I certainly never saw it since you're on ignore again for lying again. I note that @Ira has already asked why you inserted your own commentary in the link you claimed to be quoting. Looks like lying to me. Just sayin'. Now it's all buttbuddies with an obvious "christian" troll who believes in this: https://pbs.twimg...pg:large .. I AM ATHEIST since age NINE; and STRICTLY LONE INDEPENDENT OBJECTIVE RESEARCHER, so I have NO "buttbuddies (unlike you and CS etc, DS). Good to see that you've come out of your hideyhole, Ira. I am fine too. Thanks for asking. Laissez le bon temps rouler, oui? Yes Yes - glad that you agree that Donald J. Trump IS the BEST POTUS the US has ever had in the 21st century. L@@k at all the good things he has done, Ira - a lot better than having 4 more years of BHO and high taxes if the Hellary had won the election in 2016. Will you volunteer to "Build the Wall", Ira. Americans need that wall for protection, Ira. I think that deep inside, you know it too. When you quote something, either it says what you said when someone goes and looks at it or it doesn't. If it does you're telling the truth. If it doesn't you're lying. Yeah you linked him,,,, but then after you linked him or at the same time you linked you add the deconstructed/recycled when there was nothing in the other article about deconstructed/recycled or not even constructed/cycled. So there ain't no two ways about it,,,, you falsified the article you put up the link to. Telling more lies, Pussyman. Have you no shame? But of course you don't, else you wouldn't continue to wander into this science site ever again. That's your problem not mine, mate. Since you are unheeding and make trolls based on ignorance due to your ignoring things, that's your main problem, DS. And that's your secondary problem, DS; you depend on 'hearsay' from a self-confessed nincompoop bot-voting and trolling on a science site, and you use that misleading impression to 'justify' your own mistakes against me. See, DS? It's the ignore-and-insult MO that has let you down. If you had actually paid close attention and in context to what I have been telling you, you wouldn't need that bot-voting nincompoop's hearsay at all. Seriously? Seriously, mate? You now resort to that lame 'tactic' to evade the point that the quantification and the phenomena I spoke of is covered in that link? I was correct and NOT "lying". That's the point. But you didn't read/bother to understand what I said, as supported by that link. That is your most grievous false step, DS; and you have been repeating such false steps for years now. Isn't it about time you just dropped the ego and lame tactics and just GENUINELY read and understand in context (and IMPLICATIONS) and engage in objective polite discourse with all who do likewise (such as I have been doing all these years)? Go on, DS, try to ditch the past mistakes and just start afresh without ignoring/excusing your insulting tactics etc. It would be appreciated. That's what the Ira-Skippy says. I am fine too. Thanks for asking. De rien Cher. I hope you are doing as good as I am,,, I am doing so good I almost feel guilty. Yes Yes - glad that you agree that Donald J. Trump IS the BEST POTUS the US has ever had in the 21st century. If I was the late night comedian Skippy I might agree with that. But he is entertaining guy, eh? Most really stupid people who think they are the smartest guy in the room are entertaining like that. Everybody else just stays mad with him, I just enjoy the show. Will you volunteer to "Build the Wall", Ira. Non, I don't need no wall, I got a couple of really big ugly dogs with the sour dispositions. This really is not the neighborhood you want bring any foolishment into non,,, choot my neighbors are big and ugly with sour dispositions too. Non, we don't really need a wall, we have the disreputation that is better than any wall. Cher, you know I already read him from your link. That's how I know that "deconstructed/recycled" was not in him. So now you want to double down and add even more stuff that is not in there and I hope I don't notice? That was not in there too. Cher you must have linked in the wrong article,,,, it ain't about any of those things either. Try the Google-Skippy and maybe you can find an article to link us to that has that stuffs in it. As far as I'm aware, this galaxy has little to no central Black Hole/s which would be the result we would expect if my model was correct (a model that assumes a far greater mass for Black Holes than currently assumed). It is only in proposition form (not a scientifically rigorous model). Non, I don't need no wall, I got a couple of really big ugly dogs with the sour dispositions. want bring any foolishment into non,,, choot my neighbors are big and ugly with sour dispositions too. THIS is where I think the answer will be found. DIspersion of the individual bodies WITHIN the galaxy body. so I have NO "buttbuddies (unlike you and CS etc, DS). you really are illiterate, aren't you? You any where close to Boca Chica? If the universe was very old and contracting, rather than young and expanding, then most older galaxies would tend to rotate faster than most younger ones. . . But the universe isn't contracting. It's pretty hard to mistake a blueshift for a redshift. For half a century. By everyone. Both Newton and Einstein said that the Universe ought to be contracting, due to gravity. This would result in the formation of giant black holes to which all the galaxies for billions of light years were being drawn. This would produce a cosmological redshift, not a blueshift. Galaxies closer to the Great Body than the observer would be moving towards it more quickly, so would be redshifted. Galaxies further away than the observer would be moving more slowly, so would be redshifted as the observer pulled away from them. Since all galaxies, except a very few nearby ones, would be either closer to, or further away from the Great Body than the observer, all would appear redshifted. Is it just on my side or are the ratings gone ? The ratings and the newest/oldest first option both. And the universe clearly isn't contracting; at least not currently. How do you explain away the observed distant galaxy redshift? It's well known both concluded this. Einstein's equations showed that the Universe was contracting due to gravity, but since he believed it was static (he didn't believe it was expanding), he introduced an egregious fudge factor called the 'cosmological constant', in order to make it static. He later greatly regretted this, and called it his 'greatest blunder'. Now, some cosmologists are suggesting resurrecting Einstein's greatest blunder, and assigning a higher value to it, to explain 'dark energy'. Further down the rabbit hole we go. How do you explain away the observed distant galaxy redshift? See the post three posts above your one. Where is this written up? And by whom? Otherwise it is just another crackpot idea. "...the Universe ought to be contracting, due to gravity. This would result in the formation of giant black holes to which all the galaxies for billions of light years were being drawn. This would produce a cosmological redshift, not a blueshift. .."
The above assertion makes absolutely no sense because it wouldn't explain why ALL the most distant galaxies and in ALL directions are observed to be redshifted and by about the same amount; something that cannot possibly be explained away with black holes. And WHERE in the universe, according to you, are these extra super-massive black holes you speak of? If they where their, we should observe some of their effects because galaxy movements would vary with distance from them. Research it for yourself. I'm not here to be anyone's personal research butler, and I don't do one to one tutorials. Do you really expect me to have links to hand to substantiate every statement I write? That's just an underhand way of stonewalling people who disagree with you. Galaxy redshift surveys are not conducted in all directions, so your assertion is wrong. However, in the proposed model, there ought to be great variability in redshift values for galaxies at the same distance from the observer in different directions. Many surveys have suggested that the redshift is not isotropic, and varies according to the direction in the sky. However, the gravity model would suggest that there ought to be very extreme values, tending to zero. These would probably be found in the Zone of Avoidance. I suggest there is only one Great Body causing galactic redshifts in our local part of the universe, but it's possible that more than one is influencing motion. As for where it is to be found, the CMBR dipole is the most likely signpost. I should hang this quote on my wall. Links to what, exactly? Newton's correspondence with Richard Bentley? Einstein's field equations? The Gravity Model I propose as an explanation for the cosmological redshift? Report away. You clearly see yourself as an authority on here, and expect everyone else to recognise you as such. Well, I don't do forum pecking order, so you'll excuse me if I don't assuage your demanding comfort zone. What gravity model? Where is it written up? Who is positing it? Where? Is it peer-reviewed? Half an hour, then I report your posts. My view? You haven't got a clue, and are making things up. Just another crank. The Gravity Model I propose as an explanation for the cosmological redshift? Yes, obviously. Extraordinary claims require extraordinary evidence. So post the link. Otherwise you are merely yet another crackpot, like thousands of others on the internet. Err, yes they are. Which general direction do you say they never looked? You are showing extraordinary ignorance of pretty basic astronomy. Wherever the telescopes have pointed to observe the most distant galaxies they have been observed to be redshifted and by about the same extremely large amount and that clearly contradicts what you claim because that obviously cannot be explained by, as you claim, 'black holes'. You obviously don't understand the physics and you are talking complete nonsense. Why is this article called that, shouldn't it be "Unusual galaxies support dark matter theory", how is it in anyway denying dark matter? I think you are right. It is a highly misleading title. I think what they ACTUALLY meant to imply, which they (or at least just the editor assuming he didn't misunderstand the research) completely screwed up with their wording, was that those "Unusual galaxies" defy the theory that ALL galaxies HAVE significant amounts of dark matter, NOT defy the theory that there EXISTS dark matter in general. I believe they (or at least just the editor) can be validly and severely criticized for their extremely careless sloppy and misleading use of words. How does it it support it? How about use of some really sloppy hypotheses used to convince novice public interest in science that the "learned scholars of science" actually believe in things that have no proven reality? How about you go learn some science before commenting on it? I get the feeling you'd have said the same thing to someone who didn't believe in phlogiston theory. That lasted about 100 years, and there was far more evidence for it than there is for dark matter. I don't think dark matter will last that long, though. t was Antoine Lavoisier who disproved the Phlogiston Theory. He renamed the "dephlogisticated air" oxygen when he realized that the oxygen was the part of air that combines with substances as they burn. Because of Lavoisier's work, Lavoisier is now called the "Father of Modern Chemistry". I don't really care what you think, as you quite obviously don't understand the science. .....well maybe if you could convince us you know how to solve Differential Equations your name calling rants might be a bit more believable. You can't solve DEs. As proven. Off topic. Reported. Correct, and neither do you, or anyone else for that matter. No one understands dark matter, dark energy, inflation theory, superstring theory, and on ad nauseam. It's all just intellectual waffle. Sounds dead clever, though. Just another anti-science troll. Got anything intelligent to add? Nope? Looking at this in a simple way the UDG appears to have lost or not have a BH, so in a galaxy that has a BH at its centre, could it be that the material being cast into the galaxy by the BH is creating an extremely material dense area through which stars orbit causing a resistance to the inner stars with less and less effect the farther out from the galaxy you travel. Thus giving the illusion of equal rotation. What if the Milky Way is one of these galaxies, devoid of DM. That does not bode well for those boffins searching for it with their expensive detectors. Didn't I read somewhere they'd found symmetrical anomalies that made the MW look more like a chair? BTW... what does everyone think of the new format here? Impressive, I thought the work was a no-new-data response to the criticism. But they improve the earlier poor statistics of a handful of globular clusters by using a new telescope so they can revisit the earlier galaxy and add another similar by studying the star field spectroscopically instead. The DM velocity variance is claimed to be 30 km/s in a halo to compare with 7 km/s from just stars in the new galaxy, they get 8.5 +3.1/-2.3 km/s consistent with the earlier dispersion of 7.8 km/s in the original galaxy and 4.2 + 4.4/-2.2 km/s in the new. If this holds up we have a new, nice test for DM and a new, nice mystery. What stripped the DM, something like the Bullet Cluster collision strip? @torbjorn, I favor the conjecture that these UDGs never got any DM, and that's why they're UDGs. An earlier poster asked if they have central BHs. I'd be interested in the answer to that too, but not because I think BHs made galactic redshifts; because of the implication for galaxy formation dynamics. @WG; "Didn't I read somewhere they'd found symmetrical anomalies that made the MW look more like a chair? BTW... what does everyone think of the new format here?" 2nd Q first: They tested this in the sister site MedicalXpress, it works and give basic HTML (you can call me Torbjörn now) but not extended (so no emojis) and no "like" - I am going to block the trolls now. If they ask questions in good faith I will respond, else they can natter - they certainly do no good but harm for anyone else. 1st Q: Even the main paper is a bit behind the curve, seems in the simulations of theorists CDM has been better than anything else since 2017 or so. The only exception are these newfound dilute galaxies! Seems MW is calm and AFAIK has a classical DM "cold" cusp ( gravity potential like \/ ) distribution, likely half the galaxies have that calmness. The non-calm has a "hot" core distribution (that should look like "a chair" potential |_| , if that is what you mean). That would be very odd. Galaxy formation happened in the cosmic filaments that needed DM to collapse the gas until galaxy clusters formed. Though maybe not impossible, as I said in another comment I think these UDGs are not simulated/seen in simulations yet! "IF Big Bang is correct and earlier stages had black hole features created when the universe was less than a billion years old and in a much denser state between BHs, then WHAT FORCE prevented alleged 'exotic' DM from being swallowed up before the universe got any older?" I ask this because it's Electro-Magnetic forces that currently prevent normal matter from going into black holes because the friction/radiative heating creates plasma which is funnelled back away from the Bus via polar jets. So, IF the hypothesised 'exotic' DM does NOT interact electro-magnetically, then what is the force preventing alleged 'exotic' DM from all being swallowed up by BHs even granted the delays caused by gravitational 'virialization' of said 'exotic' DM? I think we're saying the same thing, Torbjörn. ........no wonder why the nonsense from the two of you is so much alike. Why isn't the conclusion, of this study, circular reasoning? With the Dark/Normal matter ratio being > 5/1, these galaxies truly defy the odds. I certainly hope there are others looking at this and thinking, perhaps this is another piece of our incomplete gravity puzzle. Have you any idea why @torbjorn_b_g_larsson, @Da Schneib, @Castrogiovanni haven't addressed the question I put earlier, mate? They asked for genuine science questions. Were they lying to us? IF Big Bang is correct and earlier stages had black hole features created when the universe was less than a billion years old and in a much denser state between BHs, then WHAT FORCE prevented alleged 'exotic' DM from being swallowed up before the universe got any older? I ask this because it's Electro-Magnetic forces that currently prevent all normal matter from going into BHs (ie, E-M friction/radiative heating creates plasma that is funnelled back away from BHs via polar jets). So, IF hypothesised 'exotic' DM does NOT interact electro-magnetically, then what is the force preventing alleged 'exotic' DM from all being swallowed up by BHs (even granting the delays caused by gravitational 'virialization' of alleged 'exotic' DM)? Why are you commenting here, you clown? You know nothing about science. .......no one has any desire to respond to such convoluted rhetoric, hell's bells man, you don't even know what you meant by any of those words. @Castro, @Benni lives for your responses. Cut it off. Let it die. This is like responding to a troll who says "U iz teh faggit!" Just let it go. Come and talk with the sane people. These trolls have no power left but to troll. Let it be; their trolling condemns them out of their own statements without any further input from anyone who matters. Just let it go. Come and talk with the sane people. ....no one has any desire to respond to such convoluted rhetoric, hell's bells man, you don't even know what you meant by any of those words. If you don't understand the concentrated science/logic stuffed into that (due to limited text format here), then ask questions instead of acting like those who troll you. .....then cease from wasting 1000 characters of allotted content & write it up, so far it's totally unintelligible. This is a new theory SEU, that blackholes can propagate on their own? When did this sparkly new theory emerge from the quantum fluctuations? Have you any idea why @torbjorn_b_g_larsson, @Da Schneib, @Castrogiovanni haven't addressed the question I put earlier, mate? Could it be that they don't understand your question? In my case it is due to having the poster on ignore. ANYTHING you see written up about BHs, the vaunted NEUTRON STAR is ALWAYS the SEED for a black hole, it starts there. It's precisely this reason that Cosmology hates ANY discussion about the 15 minute DECAY RATE of free neutrons unbound from an atomic nucleus. It is for this reason they want to engage in Pop-Cosmology psycho-babble nonsense applying half-life decay to a sub-atomic particle that is not a radio-isotopes which are subject to half-life decay rates. ...then cease from wasting 1000 characters of allotted content & write it up, so far it's totally unintelligible. ..........he writes only slightly less psycho-babble than you ever have. It's time to take your Soma. Lying again. The scientific literature proves you to be a liar. Stop lying. @RealityCheck, you will find dark matter before you find reason here. I came here asking basic questions a few years ago. I said up-front that I didn't understand dark matter theory, and Da Schneib started to explain in detail. Then I made the mistake of asking a falsifiable question about the assumptions. I did not presume an answer, I just asked "but what about this thing?" He immediately attacked me for disagreeing with his proofs, lumped me with the "EU" mongers (what is electric universe? 'cause I still don't know), started the torrent of insults (various forms of deviant, stupid liar), etc. And he was the nicest of the bunch on that side of this little food fight. There is no point in engaging. Don't bother to reply, and don't bother to block. Just take what is useful or illuminating, regardless of the source. You can make any broken clock give you the correct time if you look at it in the right way, but you can't make its hands move by talking at it. Too many ignored posts may have caused me to miss this reference on this thread, but did anyone bring up Dragonfly 44? This was discovered by largely the same team a few years ago. According to published data , this has about one trillion solar masses, has no obvious rotation and is postulated to contain mostly dark matter. Anyone want to touch this one? 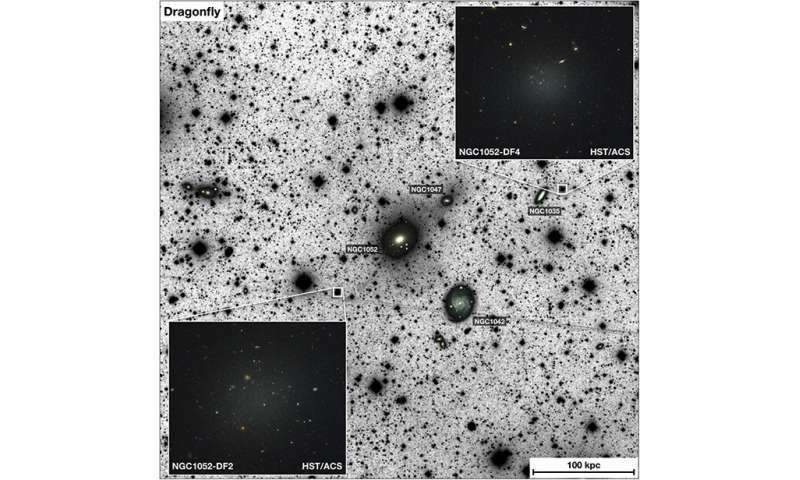 It appears not all dwarf galaxies lack dark matter and may in fact be Dragonfly 44's dominant mass. Don't shoot the messenger, and sorry if this has been covered. This is a science discussion/comment forum/site, mate. Your attempt to change the subject (from the posted science/logics substance to the publishing of same) is a non-sequitur; since I CAN discuss comment here WHILE I am completing this and other aspects of the ToE before publishing that WHOLE not piecemeal. Please stick to the point and avoid resorting to personal/irrelevant diversions from the point made for YOUR benefit as well as anyone else reading, Benni. Thanks. @dfjohnsonphd, Dragonfly 44 could be a data point for what I guess I will have to call the anti-anthropocentric principle. Dust bunnies are not stable or strong. They can only be formed by strong drafts that sweep up detritus from nearby open spaces and swirl it into eddies. Did diffuse galaxies form in situ, or are they swept-up stellar ejecta from all the surrounding "real" galaxies? I think it would take more than a few nights of observation to see how they evolved. @RealityCheck (and @Benni) was this your point? A. The standard theory relies on EM interactions to keep most matter out of black holes. B. The standard theory assumes no EM interaction for dark matter. C. The standard theory therefore has a problem explaining how any dark matter has stayed out of black holes. My issue with the whole thing is that it appears that dark matter and dark energy have both gotten stronger over time, and that you have to look very far back in time to see their effects, yet all the bits of the standard theory just seem to ignore the correlations between the two and their mutual connection to very long timescales. Every explanation is static and flat and fixed in time. Spacetime is dynamic and varied and evolving. Then there are the problems with conservation of matter and energy, but whatever. If the theory just tried to connect things that co-vary through time, I'd say conservation must be wrong. That is your first problem, mate, because it makes you look intentionally stupid/ignorant whenever you 'demand' links to what I said... because you missed/ignored it all and then complain/assert that I did not post it all before...when it's plain I have done and it is you that is the problem not me. Be and do better, Castro, else you will remain ignorant as well as stupid-looking due to your own intentional tactics of ignore/dismiss from your own prejudices and biases. You act the opposite of an objective scientist, Castro. Not good, mate. @dnat, why? Momentum and energy are conserved, but only in consistent frames. Why would you expect different frames to agree without transforms? In this observer frame, the object is moving at 20 m/s north northeast and up at 26 degrees. In that observer frame, the object is moving at 30 m/s southwest by west and down at 48 degrees. Which one is "right?" @ Da Schneib, how do frames help? First, you changed my "matter and energy" to "momentum and energy." Momentum is a form of energy, so your version reduces to "kinetic energy and energy." I meant the sum of matter and energy in the universe, since they can be converted one to the other. If some matter or energy enters your frame from a different frame, you keep conservation by recognizing a bigger frame that contains the first two. But how did it get into that frame to begin with? It had to be there already, or we're begging the question. ...started the torrent of insults (various forms of deviant, stupid liar), etc. The saddest part is that that has all been about getting stars and taking them away on some website. At least the Sneetches learned something that day on their wild, screaming beaches. @dnatwork, for such extended objects like Dragonfly 44 (DF-44) not to have formed in situ would seem a bit of a stretch, but I will bite. It would have taken a long time, but we have that on our hands, relatively so at least. Are there any other such "massive" objects that are known NOT to have formed in situ? If we are going to have one, we should likely have more than one. I understand your position on DF-44 being an outlier (extreme perhaps), but is it a solo occupant of that class? These types of observations/comparisons could lead to other more "universal" concepts. @dfjohnsonphd, my point was only that we should expect some dust bunnies in a vast universe. If you find one clump of hair, you can't necessarily tell if it's a new dust bunny or an old hairball. Most options cannot be falsified with just one data point. Also, I'm not saying DF-44 did not form in situ. How would I know? But if it did, how did it do so with no rotation? Every angular motion was exactly counter-balanced on the galactic scale over billions of years? That would be hard to achieve, especially since stars and planets form in the eddies of rotating dust clouds, and that momentum is generally conserved. And I don't know if it is the solo member of its class. It is the one they have found so far. Edit response to your edit: Why wouldn't I be civilized? You were, so I replied to you. @dnatwork, you must be dusting off a lot of the dust bunnies who post here. Perhaps you are like a super giant star with an intense solar wind. Civilized exchanges are becoming as rare as DF-44. The lack of rotation certainly is a bugger. But then perhaps so is its very nature. That it would not project all aspects of standard galactic behavior may not be so much of a surprise. If it is a galaxy largely made of dark matter, unexpected aspects of its behavior might follow from this. As I am way off my field (biochem), there are a few things in all of this that are not clear to me. Well, maybe more than a few. Be advised that I know enough to be dangerous and/or irritating. @Really-Skippy. How you are Cher? I am good and right as rain as I have been all along. Thanks for asking. Especially now that the site has removed that ratings system for them to game/skew no more! You better check it again Cher. I hate to be the one to tell you, but your karma points have gone from 1.9 all the down to minus 380. Let's hope they will 'slough off' the site now the ratings system has been removed and posters now forced to explain their displeasure in open forum. Or they can triple by the dozen vote you the bad karma, like they did to get you down to minus 390 or 380. I was not me, my voting thing is broken. You did not have any thing to do with that did you Skippy? About Dragonfly 44, I have a few questions. I read the wiki article on it. It says that it is not rotating. Then it says that by analyzing the motion of the stars in it, it must be mostly dark matter. But I would assume that this motion they analyzed is rotational motion about a center? How can that be, if it is not rotating? Obviously, there is something I am not understanding here. Can someone explain in a fairly simple way? There is nothing that is beyond current science in the question, @Whyde. The E-M forces which stop BHs from swallowing all matter in their vicinity all at once is well known science due to the accretion-disc-and-polar-jet system processes which eject much of the incoming matter back to space. Which EM forces are you referring to? Multiply gravity by the cosine of (~2pi(distance/galaxy radius)) for a formula predicting a lack of a strong dark matter effect in dim galaxies lacking a dense core. This gives a an excuse to imagine dark matter by severely underestimating a dense core mass, and by misplacing galactically-peripheral effects from the core, using the normal methods of GR. For theoretical justifications, this gravity model can be viewed as a static vector wave field generated by radiated pairs of counter-rotating field vector carriers, which make spin-2 gravity quanta and shows carriers to be their own massless Bosonic antiparticles by 180-degree phase rotation. The cosine modification model also lacks a non-renormalizability problem, as positive and negative gravity phases from evenly-distributed sources cancel out on average. Another advantage of the simple cosine modification is that a simple explanation for balanced symmetry in galactic spiral arms, coming from the breakup of a galactic ring marginally supported by a secondary gravity maximum at a galactic perimeter (cos(2p)), is provided. Essentially this process involves the core-supported ring accumulating sufficient mass to contractively self-gravitate, constricting the core's inner-periphery into an unstable bar-like extension aimed perpendicular to the galactic plane, which eventually topples over into a regular bar which then, by proximity therewith, bifurcates the ring. Anonym324154: I am intrigued by your statements, though I must admit that I don't fully understand what you're saying. May I ask two things of you? 1. First, might you be able to re-phrase what you're saying such that someone with only a high school understanding of Physics would understand it? Joe1963 I noticed your theory on Reddit a couple of weeks ago. Very similar, same type of force-reversing effect. I model gravity carriers as radiated force vectors that rotate as the carrier propagates. I tried to keep my comments here as simple as possible, really. The cosine model is the simplest version. I don't think I got a formal intro to force vectors until physics after HS although many HS advanced physics students likely have enough math exposure to follow what I'm saying. There was one typo where "p" should be "pi." Joe1963, it's a good effort on your part, by the way, excellent instincts if you ask me. Not aware of anyone else willing to periodically reverse the direction of gravity. I suppose the "damping" effect you mentioned in your theory would relate to the inverse-square rule of Euclidean geometry. Joe1963, for identifying particle spin I imagine facing the counter-rotating vector pair head on, which is sometimes called helical spin, but there are other ways of looking at it. Anyway, the vector rotation plane includes the propagation path, and the pair generally looks like a two-headed vector with opposing displacements relative to the on-path perspective, which makes it appear spin two in that 180-degree rotation of the viewer relative to the particle gives the same orientation of the vector pair, so two repeats per full rotation - spin 2. The re-normalization issue as I see it is essentially like starting with a uniform array of mass particles, then perturbing one particle, then seeing if the result is a runaway unstable type of response in the particle. The particle sees more gravity field influx on its leading side, if the influx is all pull-type then the perturbed particle theoretically can accelerate to light-speed from ~zero, unbounded energy response to a bounded input. I apologize, but I am not able to understand what you're saying. I teach high school physics, and am ignorant of particle physics. As a layman, I became interested in the Dark matter / Dark energy problem. After thinking for some time, I came up with my own hypothesis, as you can see. My work is very, very rudimentary and naive -- to any expert. I submitted it to the MNRAS. After they pondered it for a month, they rejected it on the grounds that I did not have enough hard probe data, nor enough quantifiable work (i.e. to show that the unexpected probe accelerations could be related to my equation) to justify publication. I had to agree with the reviewer's analysis. Because of my lack of qualifications, it would take me years to properly develop the idea. The quick spin discussion was not the best. I'm self-taught and retired with an EE degree, so make of it what you want. A dynamic gravity wave gets modeled, looking head-on, as a deformation process illustrated with an alternate-axis compressed circular form, at either extreme it is an oval shape and this shape apparently characterizes the wave as spin-2 because it has at least bilateral symmetry. Replace the oval with a force carrier modeled as a pair of opposed vectors doing at least half of what the dynamic wave does and you supposedly get a spin 2 quantum. By my view the dynamic wave is a carrier density (intensity) variation. Renormalization is a sort of accounting-type perspective. Another accounting issue with using gravity carriers is there is a need for input-output energy balancing. It's completely separate from waves and particles (or rotating force-vector carrier streams). After thinking about it a lot I decided matter must tend to retro-reflect gravity carriers or energy balance problems will show up. This is an effect that can be exploited along in-line spin axes best and I can imagine it operating as filament effects carrying polar-spin-dominated gravity information/energy flow. There was a recent article saying simulations can show dark matter at the center of a galaxy can be pushed outward by a supposed "heating" effect. I think they compared results to a galaxy like Triangulum. The galaxy sits close to Andromeda and is located practically on the larger galaxy's spin axis. My take is a small galaxy can get drawn into dark matter filament-type effects, which I'd describe as focused gravitational spin currents typically near the spin axis of a large spiral or ring galaxy, and as a result the drawn-in mass will have the effect of pushing apart the spin-current streams such that it is surrounded by the spin energy flow. Anyway, the balanced spiral arm-forming ring bifurcation process I mentioned before should not be too difficult to simulate with the simple radiated vector fields I've described already. It seems to me that a simple spin-modified vector-based cosine effect could replace the supposed "dark matter heating" effect. Without assuming reverse gravity, why would the mentioned "drawn-in" mass have the effect of pushing apart the spin-current streams? Why wouldn't it pull them in, instead, if gravity behaves according to current theory? Or do your statements assume there is sometimes reverse gravity? "why would the mentioned "drawn-in" mass have the effect of pushing apart the spin-current streams?" I suppose the larger galaxy's spin currents induce the smaller galaxy to rotate within a limited area covered by the currents, the rotational inertia of the galactic mass spreads the galaxy outward, to a limited extent, for as long as the spin currents in the surrounding space are available to drive it. I imagine the polar gravity of the larger galaxy will respond to the spreading smaller galaxy to a limited extent. I suppose the wave effect, with its force reversals, happens in all directions and any spin effect would be superimposed on that, so the smaller galaxy would tend to occupy a pulling maximum. Joe, I've functionally divided two unique aspects of gravitational information flow here so far into polar-focused effects and equator-focused effects. The "focus" in gravity flows is supposed here to cover differences between reflective-tending responses and retro-reflective-tending responses. I'll spare everyone any clumsy attempts to discuss atom-level matter mechanisms of retro-reflection for now and just note that to me is it very appropriately "Newton's 2nd law" in character, practically "Hebbian" even. Joe, I should have mentioned Newton's 3rd law (of kinetics) there, as "equal-opposite" reactions dominating gravity flows at multiple scales equatorially and dominating polar flows in an effect I'd equate to a focused form of mutual gravitational spin induction. Equatorial spin gravity focus effects I'd equate to dark matter sheets and polar focusing effects to filaments. Sorry dude. What triggered you there? Gibberish is what triggered me. Just link to the papers, yes? Saves a shed load of pixels getting wasted on here. PS; If they aren't peer-reviewed don't bother. Dude, I feel like I completely understand your personal need for peer-reviewed content here at all times. Are you here to tell my gravity ideas are going to shut me down? Surely no GR teachers/followers and other dark matter fans will appreciate my original thoughts on modifying gravity to remove the dark matter effect. On a comments section of a sci-news aggregate? Mate, get a life, and either write it up, or go away. Yes? Dude, you're leaving me hanging here. I wanted to know if you ran the comments here. If so then maybe you could explain where new reader ideas on modifying gravity are not allowed here. Please show where GR has broken down. Please relate this back to the neutron star merger, and the confirmation of the speed of light and speed of gravity being the same. Please show where the observation of the gravitational redshift of star S0-2 around Sgr A* doesn't conform with the predictions of GR. Please show where the Bullet Cluster results support your impenetrable word salad. Please show how the filamentary nature of the Universe doesn't match extremely well with models using DM, and only those models. Have you addressed those papers in the scientific literature? Of course you haven't. Just another poser. Write it up, or shut up. You have no idea about the subject. See my last post, and link to your papers. And don't call me 'dude', you clown. We are not in Wyoming. At least I'm not. Thankfully. Dude, your questions bore me. GR has limits. Inertial relativistic mass equated to true gravitational mass is not validated anywhere in that is it? That's the reason for saying the Bullet Cluster proves DM is real. Anyway, by your nonresponsive responses you're indirectly telling me you have no pull here, no? If so I'll look into it at my leisure, just for you. Again, so you can focus - are you just needy or do you have real mass-censorship pull here? From the rules here: "Include references to the published scientific literature to support your statements." This does not appear to be fairly and evenly applied in practice here, but you are clearly some sort of unworked intellectual property lawyer, unwitting interstate buddy, so I will merely ask you to be extremely specific - specific to the extreme, word by word where the pain you feel is most acute. Otherwise I could get buried in your unsupported negativity. "The discovery of these galaxies is difficult to explain in theories that change the laws of gravity on large scales as an alternative to the dark matter hypothesis"
I wish to disagree with this, it is a logical argument, thus to disagree it is fair to allow me to show it's very easy to generate a theory that explains such galaxies by modifying gravity in some simple justified ways that leave GR effects intact up to distances where a relevant "dark matter" effect appears on the galactic scale. "Please show where the observation of the gravitational redshift of star S0-2 around Sgr A* doesn't conform with the predictions of GR." Does that mean you are ruling out dark matter there? Are you saying GR is a some sort of dark matter divining rod and observations show DM is completely lacking here? "Please show how the filamentary nature of the Universe doesn't match extremely well with models using DM, and only those models." Are you referring to DM as an effect dominated by exotic supersymmetry-motivated particles where you think they must exist out there? Also, do you mean do it again, but this time with peer-reviewed references? Only clowning in this interaction is coming from you. Your questions are totally off-topic. You insult me but you don't know me one bit, fool, I'm better behaved than you and even only by that you are a loser here. Rest assured you are losing on every intellectual level.